The Wyrley and Essington Canal passes Pelsall Junction. 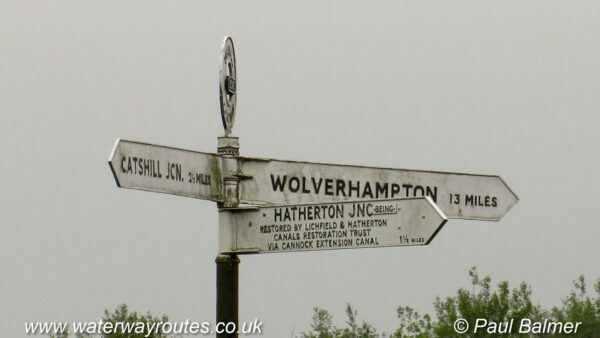 It runs from Horseley Fields Junction at Wolverhampton to Ogley Junction. The Cannock Extension Canal runs north for around 2.4 kilometers (1.5 miles). At the time the sign was errected it was proposed to extend this along the Hatherton Canal to link to the Staffs & Worcester Canal at Hatherton Junction. That restoration is now planned to join the Wyrely & Essington Canal at Fishley Junction instead.